Giuseppe Arcimboldo is most readily known for his artworks that incorporate still life and portraiture. (167) His style is readily viewed as Mannerist with the assemblage style of fruits and vegetables in which its composition can be depicted in various ways--ride side up and upside down. Arcimboldo's artworks have also applied to Mannerism in terms of humor that it conveys to viewers, because it does not hold the same degree of seriousness as Renaissaince works. 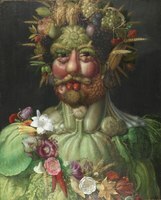 Stylistically, Arcimboldo's paintings are known for their attention to nature and concept of a "monstrous appearance." 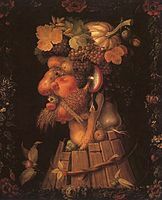 One of Arcimboldo's paintings which contains various Mannerist characteristics is, Vertumnus. Painted against a black background is a portrait of Rudolf II, whose body is composed of various vegetables, flowers, and fruits. The painting is viewed as various levels as a joke and conveying a serious message. The joke of the painting communicates the humor of power which, is that Rudolf is hiding a dark inner self behind his public image. (199) On the other hand, the serious tone of the painting foreshadows the good fortune that would be prevalent during the reign of Rudolf II. 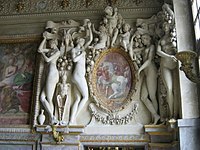 Mannerist architecture was characterized by visual trickery and unexpected elements that challenged the renaissance norms. 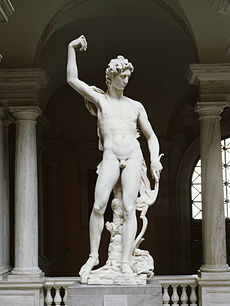 Flemish artists, many of whom had traveled to Italy and were influenced by Mannerist developments there, were responsible for the spread of Mannerist trends into Europe north of the Alps, including into the realm of architecture. During the period, architects experimented with using architectural forms to emphasize solid and spatial relationships. 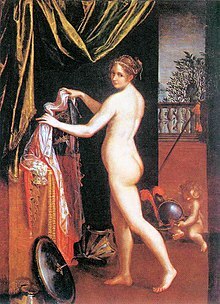 The Renaissance ideal of harmony gave way to freer and more imaginative rhythms. 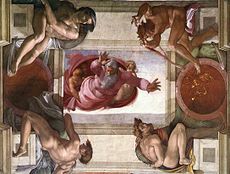 The best known architect associated with the Mannerist style, and a pioneer at the Laurentian Library, was Michelangelo (1475–1564). He is credited with inventing the giant order, a large pilaster that stretches from the bottom to the top of a façade. He used this in his design for the Campidoglio in Rome. ^ Lambraki-Plaka, Marina. El Greco-The Greek. Kastaniotis. pp. 47–49. ISBN ISBN 960-03-2544-8. Check |isbn= value: invalid character (help). ^ a b c d e f Kaufmann, Thomas DaCosta (2010). Arcimboldo. University of Chicago Press. p. 199. ISBN 9780226426877. Cox-Rearick, Janet. 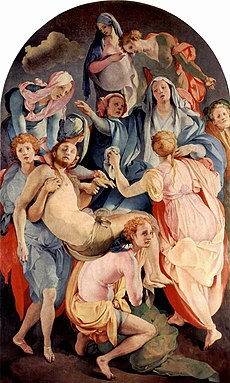 "Pontormo, Jacopo da." Grove Art Online.11 Apr. 2019. [www.oxfordartonline.com]. Marías, Fernando. 2003 "Greco, El." Grove Art Online. 2 Apr. 2019. [www.oxfordartonline.com].